A new way to experience the iconic Rosh Hashana comfort food. The author mixes chunks of fish under the supervision of Take A Break Catering's Jordan Davis. It felt squishy, just like I imagined. My disposable-gloved hands were wrist-high in two-and-a-half pounds of fish chunks and I needed to mix that mass with diced, boiled carrots and yellow onions, with the gruesome process of grinding it all up to follow. I had to remind myself that I had asked for this: the opportunity to experience the gory process of churning raw fish into the pallid patty known to all as gefilte fish. 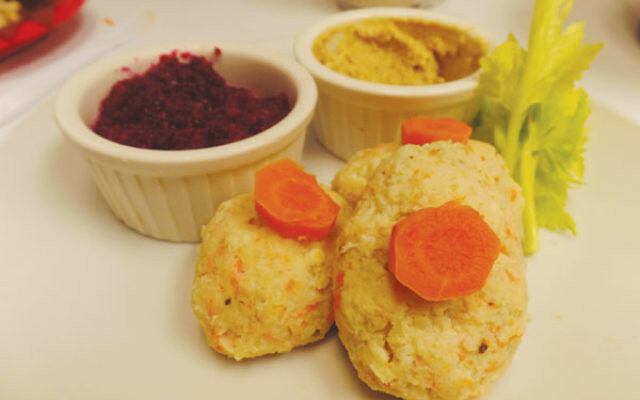 People like to mark a new Jewish year in traditional fashion, and there’s no better stalwart of Eastern European cuisine than gefilte fish. Today’s gefilte, which comes from a Yiddish word meaning “stuffed,” is a patty or log made from ground fish that is served as an appetizer on the Sabbath and holidays. 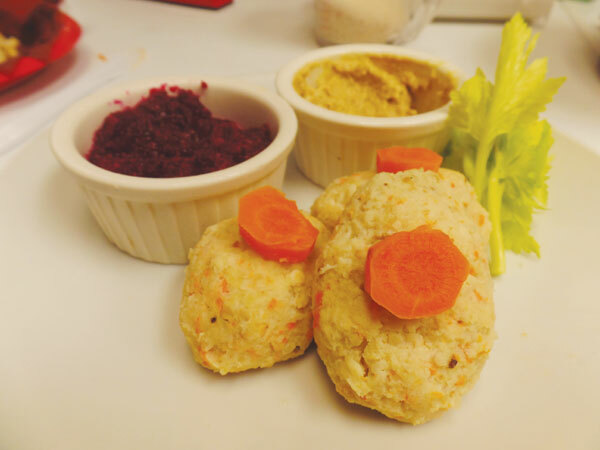 Like the Jewish people, gefilte fish is a survivor; it maintains a perpetual and unadulterated presence during a time heady with trendy Jewish foods such as spelt hallah, quinoa cholent, and Thai-seasoned matza brei. Inspired by a slab of carp I saw on display at the fish counter of the new Seasons kosher grocery store in Clifton, I went in search of kosher caterers who make the Jewish culinary mainstay from scratch. The young chefs of Lake Hiawatha’s Take A Break Catering, Yoni Siletski and Jordan Davis, under supervision of the Vaad Harabonim of MetroWest, were game. After hearing my appeal to participate in the production of homemade gefilte fish, Davis remarked that it was one of the strangest requests he had ever heard. Then he asked if I’d ever seen sausage prepared, which did little to assuage my fears about tasting the food that I termed “the hot dog of the fish world.” I neglected to tell him that I haven’t eaten gefilte fish in years. In the interests of full disclosure, homemade gefilte fish is not on Take A Break’s menu, but prepared frozen logs from A&B Famous Gefilte Fish in Paterson are a staple of their holiday catering and EZ Shabbos meals. “People have been eating A&B for their whole lives, and it’s comfort for them,” said business owner Siletski, 27, who was professionally trained at Le Cordon Bleu. “Even if I did put fresh on the menu, I think people would still go for the A&B.” Davis, also 27, is Siletski’s right-hand man and a graduate of the culinary school at The Art Institute of Fort Lauderdale. When it came to making gefilte fish I knew a grinder would be involved. I pictured a heavy metal one, attached to the countertop with a hand crank. Instead, what I got was a clean, six-quart KitchenAid Stand Mixer. There were no large fish heads, scaly skin, or foul smells, either. Just clean, fresh tilapia and flounder fillets resting on an industrial-sized cookie sheet. This was gefilte fish-making, circa 2016. These guys were enthusiastic about showing me the simple process of making gefilte fish (I didn’t say quick or clean), and they made sure to use common household items. “The one thing that takes most time is the cleanup,” said Davis. The only thing missing was a recipe printed on a creased, grease-stained index card. When I entered their strip-mall storefront, located half a mile off Route 46, I felt like a contestant on a kosher episode of Chopped. The ingredients were prepped in metal bowls on the counter and a seasoned broth simmered on the stovetop in back. Davis deftly sliced the fresh tilapia and flounder fillets into small chunks. Despite the absence of carp or whitefish, classic gefilte fish ingredients, the theme of the demonstration was traditional. That means cooking the fish in a broth flavored only with carrots, onions, sugar, salt, and pepper. “Any deviation will make any bubbe choke,” quipped Siletski. Still, he couldn’t help thinking up some “not your grandma’s gefilte fish” — how about a cilantro-and-lime-rubbed gefilte fish with grilled pineapple and jalapeno chutney? I came prepared to get messy, dressed in a work shirt, long pants, and closed shoes, and Davis put me right to work, assigning me my mixing job after I had donned a pair of rubber gloves. I also helped pack the fish, carrot, and onion blend into the grinding tool attached to the front of the KitchenAid (but not before Siletski picked out some of the larger carrot chunks; “too carroty,” he said). Siletski recommends a coarse grind. “The whole texture will lend itself to make a more pliable dough,” he said, which means less filler (aka matza meal) needed to bind the ingredients. The grinding part got sloppy, as fish juice was extracted and splattered in the process. Now you know why Bubbe always wore an apron. Nothing so far made me squeamish, but cheap horror movie scenes did come to mind while I watched the strands ooze out of the grinder. End of conversation. After draining the ground fish and veggies in a colander, they were dumped into the mixer’s bowl and a whisk was attached. “This step is when you could incorporate spices or any other flavor,” said Siletski. In keeping with tradition, no pesto, chimichurri, or curry was thrown in for us. We did add three eggs and approximately one cup of matza meal, just enough to make things stick. Now came the shaping. Davis made small, oblong patties, like the jarred variety, while Siletski artfully rolled his dough into a tight log inside plastic wrap and sealed that inside a second layer with aluminum foil. After a pot of broth was placed onto a single burner on our prep counter to simmer, the patties and log were placed inside. “Boil or bake, not both,” advised Siletski. The finished patties were a very pale tan, flecked with specks of orange and some small, white dots of matza meal, nothing like the gelatinous mass we’re used to when we remove the product from a glass jar. The log remained wrapped while it cooled, a necessary step before slicing. After removing the patties from the boiling liquid using a tool with a flat, metal net on the end, the chefs brought out a huge plastic tub of beet horseradish (of course) and doctored up some white horseradish with spicy mustard and fresh lemon juice. Yum. Because they had prepped the ingredients and started the broth before I arrived — and I didn’t stick around for the cleanup, either (thanks guys) — the entire process took under an hour. Assuming you’re an at-home cook, however, working under non-game-show circumstances, you should probably figure in several more hours. As for me, I never hesitated to eat the homemade gefilte fish because I saw exactly what went into my “hot dog of the fish world” — real ingredients for classic, Jewish comfort food. The taste? A very mild and delicate fish flavor; I eagerly devoured my entire piece. Guess that makes me a homemade gefilte fish convert. For Rosh Hashana, the thoughtful chefs suggested serving gefilte fish with a savory-sweet combination: pickled onions and drizzled honey (or agave) on top, garnished with raisins plumped in water. Not something my Bubbe would have served, but I approve of making new holiday traditions.